Blend on high for 30 seconds – 1 minute or until no more lumps appears. It will form a very liquid yellowish batter. Transfer into a bowl. Set aside at room temperature for 30 minutes before cooking. Warm a crepe pan of 10 inches diameter (26 cm), under medium/high heat, and use an absorbent paper to rub the coconut oil on the pan and grease the pan. Scoop 1/3 cup of the crepe batter into the frying pan and tilt the pan with a circular motion to ensure that the batter coats the surface evenly. The batter is very liquid and that is what you want. The thickness of the crepes will depend on how much batter you use for each. Usually 1/3 cup is what you need to make a 10 inches (26 cm) crepe but you may want to add a little more to make a thick crepe. I love mine super thin as it gets crispier. Repeat for the next crepe until no more batter left. I made 5 crepes with this recipe. 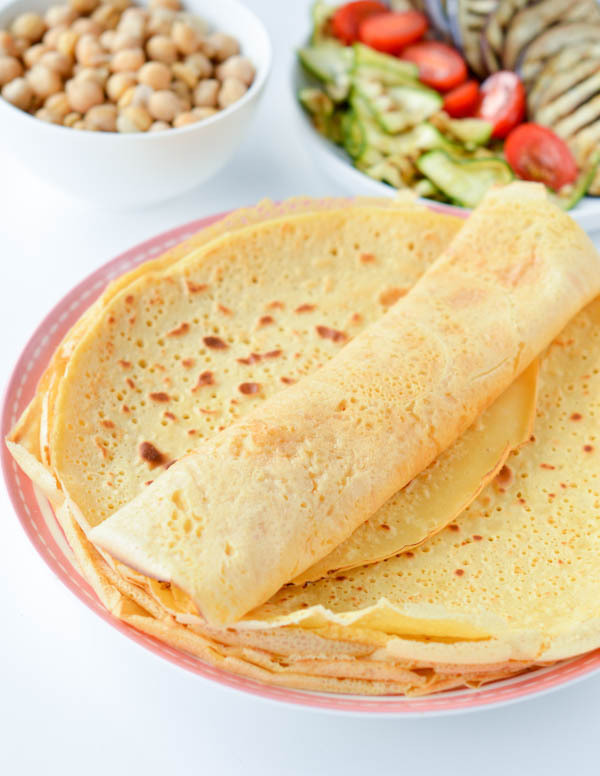 To serve fill each crepes with the savory filling of your choice. I spread hummus, mashed avocado, grilled zucchini, grilled eggplant, fresh cherry tomatoes, raw chickpeas and a drizzle of Dijon mustard.